The newly built 30-foot swift roost near the pool in Swanson Park on Thursday afternoon. Well, Thursday night was a bust as far as swifts were concerned. The Audubon Society of Corvallis and associated bird groups announced an “Albany Swift Tower Monitoring” for Thursday evening. No swifts swooped in to test their new roost. And nobody else showed up to see them not doing so. For more than 30 years I worked across Lyon Street from Albany Fire Station 11. Not once did I see or hear about swifts, those speedy swallow-like fliers, swarming the fire station on their spring or fall migrations to roost in the station’s chimney. 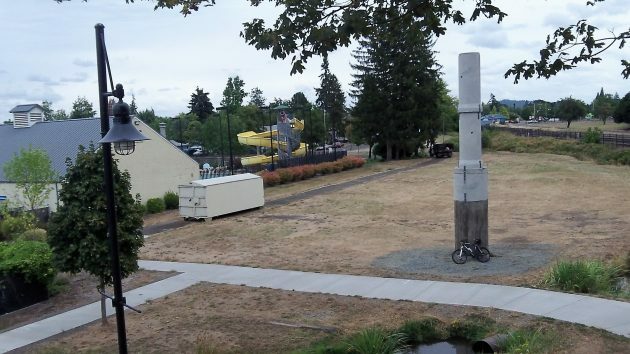 But evidently they did just that, for when the old station was demolished this summer, efforts were made to provide a similar pipe as a roost, albeit three blocks away on the undeveloped back side of Swanson Park. The 30-foot stack was formed with sections of concrete pipe held together by steel straps. The Audubon Society summarized the effort as “a collaborative partnership initiated by the Albany Fire Department, Audubon chapters in Oregon and Washington, plus the Vaux’s Happening Project under the auspices of National Audubon.” Stability Engineering of Corvallis donated its service, Albany Community Development Department expedited permitting, Albany Parks and Recreation provided the location, and Public Works did the excavation and backfilling, according to the society. Advantage Precast of Salem supplied the tower sections, and Forslund Crane did the heavy lifting for the assembly. Hasso, we’re trying to entice the swifts in the area to the “tower” with both some of their guano inside the tower, and with a volunteer broadcasting calls in the evenings around sunset as roosting time approaches. Some Vaux’s Swift nest in our general area, in our towns of Corvallis and Albany, often in unused residential chimneys. Most of their population nests further north into British Columbia. Volunteers report that some swifts have flown over the park area but haven’t inspected the structure yet. The broadcasting of their calls seems to get their attention. Last night (Wednesday) there was a problem with the broadcasting system; we’ll have to sort that out quickly. Nesting season is over, and we are now seeing larger and larger numbers of these swifts gathering in Oregon and Washington. The chimney at Weigand Hall (OSU campus in Corvallis) has been hosting more than 1,000 swifts the past several nights. There may certainly be other migratory roosts in Albany, but general reporting of these migratory roosts is not uniform. We certainly don’t know about all their roosts. It might make sense, economically-speaking, to recreate the illusion of a new Police Station not unlike the faux chimney effort. Doing so would allow for monitoring the police traffic at the new “facility.” To insure proper use of the new and improved illusory Cop Shop, City Fathers ought to consider constructing an empty Donut Shop storefront across the street from the new fake Police building. Just driving by it does not look very tall. Anybody know how tall it was sitting on the old fire station? I do not know anything about the bird, but they may be looking for some where taller? ?